This picture shows a power meter, transmitter and an antenna. In order to connect a power meter to measure the power into the antenna, a coupler is used. Power meters measure small amounts of power and can not be connected to transmitters directly unless a large load or attenuator is fitted in between the transmitter and the power meter. This can be seen in the diagram as a coupler with 40 dB of attenuation. The coupler works by tapping off a small part of the power which is 40 dB lower than the power passing through to the antenna. The power meter will then read 40 dB lower and so by adding the 40 dB onto the power meter reading the forward power (into the antenna) is measured as 56.7 dBm. The antenna has a gain of 20 dBi and so the EIRP of this system is simply 56.7 + 20 = 76.7 dBm. This is the Effective Isotropic Radiated Power (EIRP) of the antenna. Now an Isotropic reference antenna radiates, or transmits equal amounts of power or signal in all directions. This is of little use and is a theoretical antenna. It has unity gain so what you put in you get out. 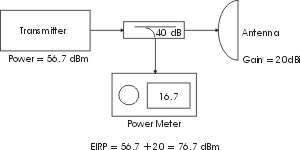 So the EIRP is a comparative measurement which is used to compare every antenna to one single reference, the Isotropic antenna. The measurement is calculated by adding the antenna gain and forward power minus any loss. The system would normally have a transmit filter before the antenna to limit the unwanted sputious signals often generated by the transmitter. This filter gives us a loss. This loss can be as much as 2 dB which we would subtract from the EIRP figure given above. Each power meter is calibrated to a particular frequency by the user and the coupler is also calibrated to give an attenuation calibrated at a particlular frequency. These frequencies are normally listed over a range which is determined by the manufacturer.